Walter “Graf Punski” Krupinski was born on 11 November 1920 at Domnau, in the Friedland region of East Prussia. He was employed by the Reichsarbeitdienst before being discharged a few days after the outbreak of war in 1939 to take up a place at the Luftkreigsakademie at Berlin-Gatow where he underwent basic military and flying training. Following the completion of his fighter pilot training in Vienna in October 1940, Krupinski was transferred to 6./JG 52. He flew combat missions over France and England and, although frequently in contact with enemy aircraft, did not gain any success. He was promoted to the rank of Leutnant in February 1941. By September 1941, Krupinski was operating over the Eastern front. He recorded his first victory in the theatre against a Russian DB-3 twin-engine bomber south of Leningrad. By the end of the year he had seven victories to his credit. On 25 October 1942, he was shot down in aerial combat and baled out wounded. 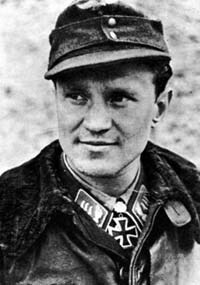 Leutnant Krupinski was awarded the Ritterkreuz on 29 October 1942 after 56 victories. By the end of 1942, his victory total stood at 65. Krupinski then spent three months as a fighter instructor with Ergänzungs-Jagdgruppe Ost in France. Krupinski returned to Russia on 15 March 1943. In May, he was appointed Staffelkapitän of 7./JG 52 based at Taman on the Kuban bridgehead. He scored two victories on 5 July to raise his victory total to 90. However, on landing Bf 109 G-6 (W.Nr. 20062) “White 9”, he collided with another Bf 109 and was badly injured in the resulting crash. In August, he recorded 27 enemy aircraft shot down, including his 100th victory on 18 August. Krupinski recorded his 125th victory on 27 September. He achieved his 150th victory on 12 October. He brought down the Staffel’s 1,000th victory, and his 154th, on 13 October. Oberleutnant Krupinski was awarded the Eichenlaub (Nr 415) on 2 March 1944 for 174 victories. He recorded his 175th victory on 9 March. At the end of March, he claimed three Russian T-34 tanks destroyed. Krupinski left JG 52 and Russia on 18 April 1944, with his victory total at 177, to return to Germany and take up command of 1./JG 5 which had returned from the far north for Reichsverteidigung duties. He gained four further victories with JG 5. Krupinski was transferred again, this time as Gruppenkommandeur of II./JG11 based at Hustedt, near Celle, taking up the post in May 1944. With the Allied invasion of France in June 1944, the Gruppe was rushed to Normandy to operate from makeshift strips on low-level ground support missions. Krupinski claimed a further 10 Allied aircraft shot down before he was wounded on 12 August when exploded motor of his Bf 109 G-5 (W.Nr. 110 244). He suffered burns to his hands and face requiring hospitalisation. Following recovery in hospital, Hauptmann Krupinski was posted to take command of III./JG 26 on 27 September 1944. He claimed his 192nd to 195th victories flying with the unit. He led the Gruppe until its disbandment on 26 March 1945. Krupinski joined Adolf Galland’s “squadron of experts” in JV44. He began training on the Me 262 on 2 April 1945. He was to record at least two victories flying the Me 262. In post-war years, Krupinski was to have successful career in the Bundeswehr rising to the rank of Generalleutnant. He passed away on 7 October 2000. “Graf Punski” Krupinski ended the war with 197 confirmed victories recorded in 1,100 missions. He had gained 177 victories flying over the Eastern front and 20 over the Western front, including at least two four-engine bomber, eight P-51 Mustang fighters and seven P-47 Thunderbolt fighters . He had been wounded seven times, baled out on four occasions as well as surviving numerous crash landings.